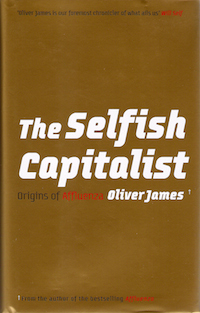 In this sequel to his Affluenza (2007), Oliver James argues that capitalism as practised recently in the richer English-speaking countries – that includes Australia – is making us miserable. His ‘affluenza’, a portmanteau word fusing ‘affluence’ and influenza’, is the pattern of chronic over-work, debt, anxiety and waste induced by our obsession with goods and income, and James traces its cause to economic policies. He defines Selfish Capitalism as the neoliberal Thatcherism adopted in the 1990s and finds that, despite the ‘trickle-down’ rhetoric, those policies made the rich very much richer while leaving the rest of us no better off financially and significantly worse off in other ways. Labour market deregulation undermined job security and held down real wages, the media joined business in successfully promoting perceptions of relative poverty even as real levels of consumption reached new highs, and debt increased enormously. (In Australia, mortgages rose from 2.8 to 4.2 times average annual income between 1994 and 2004 while other personal debt tripled). If Selfish Capitalism is so bad, what is Unselfish Capitalism? Simply capitalism moderated by social policies and structures which support equality and social cohesion, as practised in Japan and mainland Europe. James is a clinical psychologist and he focuses on levels of ‘distress’ – basically unhappiness and mental illness. Others have presented similar arguments blaming unrestrained capitalism for social inequality, family breakdown, declining moral standards, teenage crime and many related problems. They may all be right. Convincingly untangling all the causes and effects might be impossible – there are just too many factors to consider – but Oliver James does a good job, supporting clear arguments with good evidence. This review was written and originally published in 2008 but the book is still very relevant and, like The New Nature Writing, has continued to come up in my conversation. Its relevance to me now is more to do with sustainability than with mental health: if we are to avoid environmental disaster, we have to reduce our consumption – drastically – and this book presents other reasons for doing just that, and points towards solutions. David Wann (see below) has been heading in that direction, too. The ‘Further Reading’ list extends and updates a reference and reading list I compiled at the time but didn’t publish. Affluenza is the title of three books written between 2001 and 2007, each with a different subtitle, focus, and country of origin. • Affluenza: The All-Consuming Epidemic (2001) by John de Graaf, David Wann and Thomas H. Naylor, ISBN 1-57675-199-6. These three Americans, author and film-maker De Graaf, environmental scientist Wann and economist Naylor, defined affluenza as ‘a painful, contagious, socially-transmitted condition of overload, debt, anxiety and waste resulting from the dogged pursuit of more,’ six years before James wrote his first book. Here’s their book on Wikipedia. Wann has followed up with two more books on sustainability, Simple Prosperity and The New Normal. • Affluenza: when too much is never enough (2005) by Clive Hamilton and Richard Denniss. Allen & Unwin, ISBN 1-74114-671-2. The book on wikipedia. The authors, both economists, are now best known for their leadership of The Australia Institute. For an overview of the concept of affluenza and links to more related ideas, see Wikipedia/Affluenza. Monbiot in the Guardian: “Neoliberalism is creating loneliness” and an epidemic of mental illness.